Not to be confused with the ambient hot/cold temperature of our surroundings, colour temperature is a characteristic of visible light that has applications in lighting, photography, cinema and manufacturing. In the same way that lumens (Lm) can tell us how bright a light source is, colour temperature, measured in degrees Kelvin (K), is able to tell us the perceived warmth or coldness of a light source. Light sources with high Kelvin ratings, 5,000K or more, are described as "cool" and have a sharp, bluish tone. Light sources with low Kelvin ratings, 4,000K or less, are considered "warm" and have a soft, yellowish-orange quality. For every type of light there is a colour temperature to match. For instance, the flame of a candle has a Kelvin rating of 1,850K, sunlight is rated at 5,780K and moonlight has a rating of 4,100K. Choosing the colour temperature of a light bulb can be just as important as finding the right fitting or brightness. Plugging in a bulb only to discover the light is too warm or cool can leave you feeling very disappointed. Incandescent and halogen bulbs are only capable of producing light with a single colour temperature. LED light bulbs on the other hand are able to replicate a huge spectrum of "white" light. 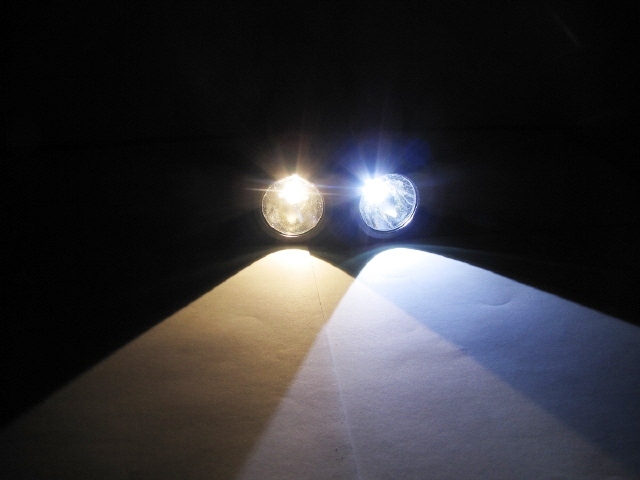 The current standard for the LED lighting industry is warm white (3,000K) and cool white (6,000K). Warm white has become the benchmark for residential lighting. Most customers prefer warm as it closely resembles the incandescent and halogen bulbs they are replacing. Typically used for general illumination around the home, the soft toned light helps to promote a relaxed and comfortable atmosphere. Cool white is used in applications where a brighter light source is needed and can serve both functional and aesthetic purposes. They can give a space a very modern feel or enhance the appearance of existing decor, particularly where a primary colour palette has been used. They are also suitable for rooms with white finishes, such as the kitchen and bathroom. In commercial environments and public spaces, cool white is more commonly used. Offices use cooler looking lighting as it helps to stimulate employees, but homeowners tend to avoid using too much in their homes as it can make a room appear too clinical. Using warm white and cool white in combination is not uncommon and can enhance the appearance and functionality of a room greatly. For example, in a kitchen warm white bulbs can be used in the ceiling to create general ambience while cool white bulbs can be installed on the under side of the kitchen cabinets to create a suitable working light. Remember, if you are stuck for which bulb to buy, we can help. Our lines are always open and our team of experts can help you choose based on your needs and preferences. Call 0116 321 4120 or email support@wholesaleledlights.co.uk. This entry was posted in Advice on 29th June 2012 by Richard Clarke.